We will be discontinuing this product so we are only offering grab bags at this time. We are not restocking colors so are unable to offer pick your colors.. This listing is a GRAB BAG of Shabby Chic Rosettes - PRINTS AND PLAIN. 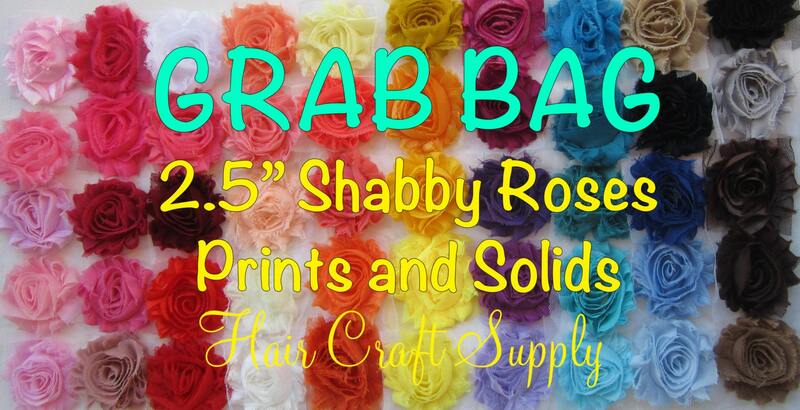 GRAB BAG ONLY - this is a discontinued item so packages will vary from order to order. Each rosette is made of chiffon and measures approx 2.5" (6 cm) These chiffon flowers have a shabby vintage look. Flat at back - prefect for crafting! Add a felt circle to the back for added support. Flowers are on mesh and are untrimmed. Love what I got! Thank you!